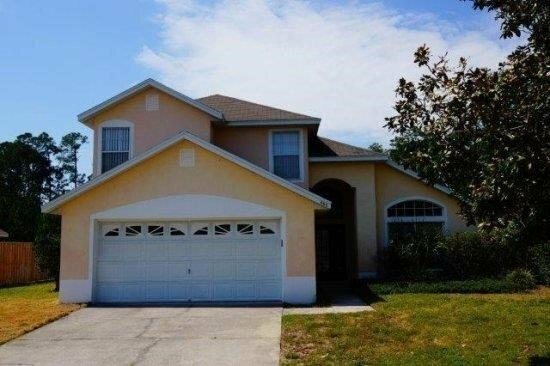 The villa is situated in a quiet location offering easy access to Disney World which will take about 15 minutes by car. This vacation home is also well placed for all the other major attractions in the Disney area. Westridge has tennis courts, volleyball and a childrens play area available. Westridge is located on US27 at the west end of Highway 192 which is home to many shops, supermarkets, petrol stations and a multitude of restaurants catering for a variety of tastes and price brackets. There is a newly built Publix supermarket within 5 minutes drive of your villa. Your luxury vacation home has it's own solar heated, swimming pool which is fully screened and those who fancy an early morning wake up swim will appreciate the convenience of having pool access direct from the master bedroom via patio doors. The home also has electric pool heating if required for the colder months. Pool furniture is provided along with a supply of pool towels for those lazy days spent basking in the Florida sunshine. The two story accommodation comprises of four bedrooms and 2.5 bathrooms along with a fully fitted kitchen and breakfast area. The spacious accommodation also has a large family room with access to the patio and pool area through sliding doors, a separate living area and a further formal dining area. There is also a large double garage attached. The separate laundry room houses a washing machine and tumble drier. On the ground floor the master bedroom is fitted with a King size bed and has an en-suite bathroom attached. There is a 32" flat screen in the master bedroom. The remaining three bedrooms are on the second floor along with a further full bathroom. The second and third bedrooms each have two twin beds and the fourth bedroom has a queen size bed. The twin bedroom both have flatscreen TV's and there is also a 32" flatscreen in the queen room. Your luxury Westridge vacation home is well equipped and furnished to a high standard. As you would expect the villa is tastefully decorated and fully air conditioned. The lounge has a 42" flatscreen connected to the cable network is provided in the lounge plus DVD playe.. Access to the villa is by key pad which removes the need to collect and return keys from our management company. Wireless internet is installed.The kitchen is fitted out with all the equipment you would expect to need during your Florida vacation. This includes a full size oven and hob, a microwave oven, a large fridge / freezer with icemaker, dishwasher, waste disposal, coffee maker, blender, juicer, toaster and a full set of cutlery, crockery, utensils and housewares. The villa has a telephone system. Local calls are free, long distance and international calls can be made via a telephone calling card widely available throughout the area. The price includes all gas, electricity, linen, towels etc. Even those small items that are occasionally required are provided such as vacuum cleaner, iron and ironing board, hairdrier etc. Families with infants will be pleased to note that a travel cot is available at no extra cost.